Excellon Resources ‘La Platosa Mine’, Durango, Mexico. Photos by author. Civil disobedience has halted production at Mexico’s “top grade producer of silver.” Farmers of the La Sierrita village, a close knit community of about 50 families, located 40 minutes north of the city of Gomez Palacio, Durango, have shut down the La Platosa mine owned by Canadian firm Excellon Resources for over a month. This comes in response to the company’s refusal to negotiate with the community over its requests for the preferential hiring of local people on whose land the company operates, as well as pay the rental rates for its use. Labor conditions within the underground mine where many local residents work is also an issue. Dozens of community members have maintained a nonviolent blockade of the one road into the mine, allowing only essential maintenance workers to pass, resulting in extraction grinding to a halt. In recent years mining operations have drawn local protests from Peru to Tanzania and Papua New Guinea. Mexico is the site of several high profile struggles, nearly all involving Canadian companies. Communities are opposing the loss of their land and its contamination with toxins, including arsenic and cyanide, which are used in abundance in the extraction of gold. 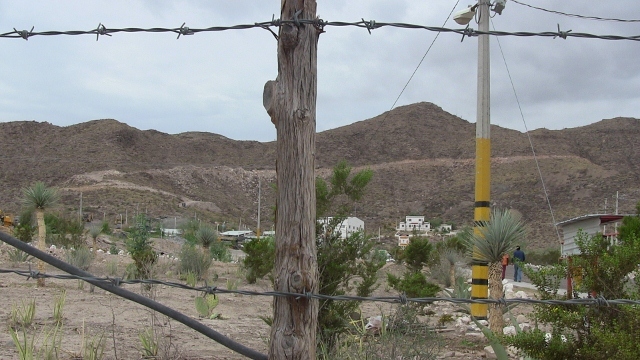 Unlike many of these conflicts, the residents of La Sierrita have succeeded in inflicting a substantial economic cost to the company. As in the case of an effective strike, it is hoped that the continued shut down of its sole mining operation will eventually force Excellon to yield. Along with the community’s unified resolve to maintain the blockade, what distinguishes this struggle is that so far, it has succeeded in effectively disrupting the mine without triggering violent repression from the Mexican government or the company. Many human rights activists are accustomed to campaigning against U.S.-based transnational corporations, which continue to dominate many sectors, but in the particularly violent, exploitative and dirty world of resource extraction, Canadian corporations are among the worst culprits. Since the mid-1990s, the Canadian-based mining sector has emerged to become the biggest in the world. The Toronto Stock Exchange is now the principal source of finance capital for mining operations. In 2010, Canadian mining companies held assets worth $129 billion internationally, with 90 percent owned by the 70 largest firms. Mexico is the second biggest country for Canadian overseas mining operations. With five mines, Goldcorp has the largest Canadian corporate presence in Mexico. Goldcorp also owns the infamous Marlin mine in Guatemala, where the company has been implicated in the deaths of human rights activists protesting its incursion into traditional indigenous territories. It is unfortunate that a company that earned $30 million in gross profit in one year , largely from the La Platosa mine, can’t make the minimal commitment to support development of our community. If they return 50 percent of our land tomorrow, we would be happy to ensure that our returned land is from that very area [with the new silver deposits] because we know that we can find another company that will not run roughshod over our rights as landowners. Were Excellon to follow through on its threat and shut down the mine, it would of course have an immediate economic impact on the area, with 200 workers losing their jobs. However Pacheco’s confidence recognizes the favorable position of the ejido: The high price of precious metals dictates that mining interests cannot stay away for long. The position of strength from which a tiny rural community can set the terms against a transnational mining company depends on its ability to take effective direct action without triggering crippling repression. Acts of repression frequently elicit condemnations and support from the broader public when widely publicized, but its impact depends on the extent that state authorities or corporate interests concern themselves with international opinion, and the ability of the community to overcome the fear engendered through acts of violence. Less disruptive protests in the past two years against Canadian mining operations in San Luis Potosi in northern Mexico and San José del Progreso, in the south, have resulted in attacks, death threats and the murder of anti-mining leaders, carried out by municipal police or private security forces contracted by the companies. Activists have not yet succeeded in either case in drawing a substantial amount of negative publicity to the mining companies directly involved. The response of the Canadian government has been negligible. With so much money at stake mining silver from La Platosa, something must be holding Excellon back. It’s not likely the consciences of those in its management. On July 5, three days before the blockade began, an election was conducted at the mine to determine which union would represent Excellon’s workforce. Workers were galvanized to form a union when two years earlier, three miners accused by the company of theft were detained overnight at the mine and tortured by mine security guards and state police before being let go with a letter of apology from the general manager. No charges were ever leveled against the workers. A worker died underground that same year from a rockfall caused by insufficient safety provisions. 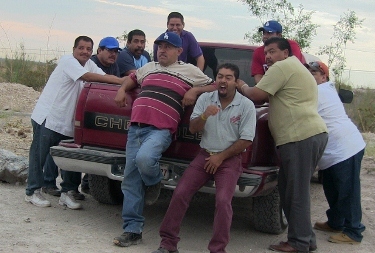 An international observation team including labor rights activists from Canada, the U.S. and Mexico arrived before dawn in the parking lot outside the gate to the mine property on the election day. We fanned out in the darkness along the road next to the gate so that we would be visible to workers arriving for the morning shift. I watched as workers arriving at the mine in rusted dusty cars or as passengers on the company bus, had to pass by 40 heavily armed and masked state police, whom I later witnessed receiving complementary styrofoam lunch boxes distributed by the company. A hundred men bused in by a competing company-controlled phony union, took up positions along the side of the narrow dirt road about 500 meters away. A group of international observers reported seeing several armed with large sticks. Though no overt acts of violence occurred, the atmosphere was markedly tense. Some police grew bored during the slow hours between shift changes, stowing their automatic rifles and drawing their cell phones instead, but a constant cold war existed between the observation team and the company union goons and security guards. The only person clearly enjoying herself was the lone taco vender at the edge of the parking lot, who witnessed a quadrupling of her daily clientele and fast sales of bottled water under the rising desert sun. Later that day, assisted by six managers receiving ballots in violation of the previously determined voter’s list, the company union won the election by a single vote over the national miner’s union, Los Mineros, which the vast majority of the workers had previously joined. Intimidation appeared to have worked. Had international observers not been present, and had the Mineros union not decided to avoid provocations by not busing in supporters from other mines, it could have easily been worse. Chris Benoit, an organizer with Proyecto de Derechos Económicos, Sociales y Culturales (PRODESC), a Mexican labor rights NGO which has been supporting the La Sierrita community and providing legal counsel, suggests in an email that members of the ejido have successfully “raised the political cost of taking action significantly” against the blockade, which is primarily comprised of families, children and the elderly. PRODESC, with transnational allies including Mining Watch Canada and the United Steel Workers union, has also demonstrated its ability to quickly raise publicity against the company. Following the unsuccessful meeting with the Excellon vice president on July 26, PRODESC, along with law students at York University in Toronto, filed a complaint with the Ontario Securities Commission, arguing that the Toronto, Ontario-based firm had not complied with its legal obligations to inform its investors of significant “material changes” to the status of its only mine: namely its closure for over a month due to a community conflict, as well as the company’s subsequent threat to the ejido that it would shutter the mine permanently. Through the effective organizing within the La Sierrita community and the support work coordinated by PRODESC, Benoit reports that the Mexican government has shifted its stance from aggressively pro-company, to intervening in more of a mediator role. At a meeting in Gomez Palacio, representatives of the federal ministries of the economy and agriculture as well as the Durango state government publicly called on the company to negotiate in good faith on August 2. Excellon’s initial prediction that the “illegal blockade” would be shut down by Mexican authorities within “24 to 48 hours,” has not come to fruition. Excellon chief operating officer Robert Moore walked out after five minutes of a second meeting brokered by higher level Mexican government officials on August 13 in Mexico City, protesting the continued presence of the blockade. State authorities reiterated their recognition of the ejido’s willingness to negotiate and promised to continue pressuring the company to enter a meaningful dialogue. These developments are nearly unprecedented in Mexican mine struggles. This example of successful local direct action and international support suggests future possibilities for organizing for social and economic justice against transnational corporate impunity and state acquiescence. Named the Chorizo Law, it mashed together parts of different bills that outlaw union shops, eliminate environmental impact surveys for industrial projects, make it more difficult to hold police accountable for abuses and killings and allow the permanent replacement of striking workers. Join PCASC for our 4th Annual Brunch on Sunday, June 23rd.